Patience has become a key part of Mitch Honeychurch’s game. Western Bulldogs have made two further changes to its playing list. westernbulldogs.com.au reviews Mitch Honeychurch's 2017 season. Honeychurch: "Looking forward to the season ahead"
Mitch Honeychurch is a fiercely competitive midfielder/forward who wins plenty of contested ball and is also proficient on the outside. Despite rehabilitating a broken arm in the early stages of the 2013 TAC Cup season, Honeychurch returned in time to play in the national championships for Vic Metro, going on to be named the team’s most valuable player and gain All Australian selection. Honeychurch boasts clean hands and has no trouble racking up possessions, while also possessing the ability to shift forward and kick goals. 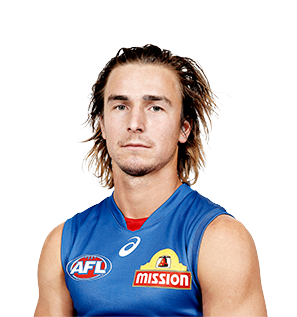 Honeychurch was drafted to the Kennel with the Bulldogs' third selection (pick 60 overall) in the 2013 NAB AFL Draft, and debuted in round 15 of the 2014 Toyota AFL Premiership Season in the Western Bulldogs win over Melbourne. Honeychurch was a member of the Footscray Bulldogs' 2016 VFL Premiership side, averaging 27 disposals per game across his 17 games at state league level in that season. Honeychurch played six straight games from round 13 after playing two AFL games in 2016. The 22-year-old finished the season averaging 15 disposals per contest, including six score involvements and his 5.7 tackles per game placed him fourth at the club. Was again a consistent performer at VFL level, averaging 21 touches and kicking 13 goals in eight games for Footscray. Ten tackles against the West Coast Eagles in Round 15 was a career high. By his own admission, Mitch Honeychurch was disappointed to play only the two AFL games this season, but at just 21 years of age, the dogged midfielder has plenty of upside. Averaged 27 touches, four marks and six tackles over 17 games for Footscray this season and was a key member of the Dogs’ second VFL premiership in three seasons. Despite being lightly built the 21-year-old is ferocious at the contest and his defensive pressure is a highlight. Not one to waste an opportunity at AFL level, the third year forward/midfielder was excellent against Port Adelaide in round 12, recording a career high 22 disposals, five marks and six tackles. Was consistent all season and if not for the Bulldogs’ depth in the small forward position would likely have had more opportunity. Honeychurch was named among Footscray’s best in 13 of his 17 games. “It was a pretty good year in the VFL, obviously I wouldn’t mind playing more AFL footy but we had a pretty good AFL midfield, so hopefully I can play some more games next year and go from there. Mitch Honeychurch continued his striking pre-season form into the home and away season, with a spot in the side from rounds one to seven. His season was twice interrupted by injury, but the dogged small forward earned his way back into the senior side for round 22 and played the final three match of the year. Honeychurch finished the year with 11 matches, his most notable in round two against Richmond. 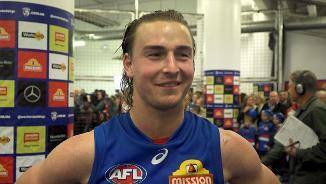 The 20-year-old picked up 18 disposals, four marks and six tackles – and a Rising Star nomination. His pressure was a key cog in the forward-line set up, with defensive acts the highlight of his game this year. Honeychurch ranked 10th among rising stars (first and second year players) in tackles per game. A sharp handball from Bob Murphy, a clean take, a split second decision, a snap off the right boot, and a goal. 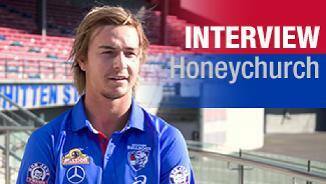 That’s how Mitch Honeychurch’s AFL career began. Joining the exclusive first kick, first goal club in his round 15 debut against Melbourne, the 19-year-old made an instant impact at senior level. Honeychurch played just three games in his debut year, but played a hand in two memorable victories over Melbourne and Geelong. Ferocious at the contest, the midfield/forward showed at VFL level to be prolific ball winner and regular scoreboard contributor, including a five goal, and 25 disposal best on ground performance against minor premiers Port Melbourne. Honeychurch carried that through to AFL level, registering seven tackles in the Bulldogs’ round 16 loss to Geelong. Honeychurch kicked 21 goals at VFL level in 2014. “You can’t ask for a better start and to get the win by six points – it was pretty nerve wracking at the end there, but we got the win which was great.” – Honeychurch following his debut at senior level.